A boy aged 5 yrs , suffering from MUSCULAR DYSTROPHY since 2 yrs and was told by the physician that this is a incurable condition and have no treatment for the condition so for . The Father of the boy is in defense service and he consulted me before few days back. I narrated all the procedure which we do for every patient. He came to day for the consultation. We completed possible examination and tests of ETG AyurvedaScan and the related examination, possible to the younger child. A part of the examination report is here for the observation. ETG AyurvedaScan continuous monitoring device provides at a time many parameters which of use in diagnosis of the genesis of the disorders along with the other ETG AyurvedaScan examinations. See the following report. Above report shows the regular recording and continuous recording of the many parameters of the vital organs functions for example pulse rate per minute and oxygen saturation in blood and blood pressure and temperature and heart functions etc etc recording time to time at a set interval An extra lead is for the ETG AyurvedaScan monitoring the part and organs for a long period. In this case the long term recording of ETG AyurvedaScan shows the unnatural findings related to some body systems which are not supporting to care for normal functioning. In this recording , it is shown that there is pathophysiology present in the neuro-musculo systems which is related to the upper part of the digestive system and large intestines. The problem of the boy is a combined and cumulative disorders of the Upper digestive system, muscular system, lymphatic system, circulatory system, autonomic nervous system either in parts or complete involvement. A prescription of Ayurveda and Homoeopathy and Unani and other remedies is given to boy for 120 days. Earlier it is seen in Muscular Dystrophy cases, Combined and Integrated treatment of Ayurveda and Ayush, provides treendous relief to the victims of these disorders. In our research center, we are treating muscular dystrophy patients successfully with relief. The disease MUSCULAR DYSTROPHY is an INCURABLE DISEASE CONDITION and in modern medicine there is no treatment, but hope of light is persists with Ayurveda and AYUSH therapies treatment. Let the people should use these therapies , if it is said the disease is incurable by a physician. A NEW STUDY SHOWS THAT use of pain killers may cause heart / cardiac problems / disorders. Earlier to that it was also assumed that pain killers cause and pay a role for KIDNEY failure. Below given report , published in DAILY JAGARAN HINDI NEWS PAPER, published from Kanpur, uttar pradesh India, should be taken in notice by readers. 1- Pain of all kinds can be managed by AYURVEDA and AYUSH therapies treatment, whatever they may be. 2- The necessity in pain management that patient shuold be given instructions , what he should do or should avoid to save from pain attacks. 3- Many Food articles triggers and alleviate pain level. Aggravation of pain is always circumstantial due to ignorance. In fact AYURVEDA is very clear about the pain causing food and pain elevating food both. What to do or what not to do, this is in management of AYURVEDA, suggesting during and after treatment. 4- Most of the Neuro-musculo skeletal problems are not covered by the Modern system of medicine and for that ignorance of physicians practicing Modern medicine are not aware that if the remedies or treatment are not in their system, there is no treatment, while the conditions they say is treatable in AYURVEDA and AYUSH treatment. Ignorance is the one of the reason for managing painful conditions. 5- It is blaimed that Ayurveda is slow to work. THIS IS A WRONG NOTIONS. The fact is that Ayurveda / Ayush therapies treat the basic cause of the pain causing factors. while in comparison the painkillers only minimised pain and do nothing with the basic / root problem of the pain causing factors. There is difference in between the pain killers, which suppresses the pain and do nothing with the causing factors,comparatively AYURVEDA and AYUSH therapies treatthe causing factors of the pain in root level. 7- Kidney lithics / Kidney stone pain can be managed well including treatment, Ayurveda / ayush remedies melts the stone and cures even hydro-nephrosis presents. Pain killers can never be discarded or left for treatment. Pain-killers are the essential part of the treatment. My experience with pain killers are very nice. My style of using pain killers are like this. I use pain killers when patient is very severely affected with the pain and pain can not bearable for patient of any age .I use pain killers in all painful conditions, whatever they could be used for minimizing pain level. This I do for saving patient agony and to provide relief and minimizing pain and miseries of pain effects. As a result in sense of relief, I again watch and see the exact reason of pain. These findings of true nature leads to the exact reason of pain. When causes of pain is treated the , the refelective sensation of pain relieves. This I do to save patient from pain intensity. the actual understanding the  condition of patient. killer can react in this way. affected part inflamed and swelled more and more, causes serious illness. there will be no need of pain killers. The last goal of the physician should be provide relief from pain to a patient for which he is treating by any efforts, whatever they may be and intelligent use of the tactics should be applied as and when required. एच०आई०वी० के रोगियों का हमारे केन्द्र मे इलाज किया जा रहा है /In our outdor hospital, we are treating H.I.V. infected patients by AYURVEDA AND AYUSHA AND ALLIED METHODS OF TREATMENT SYSTEMS. नीचे एक पुरुष की रिपोट दि गयी है / यह उस समय की जान्च रिपोर्ट है जब मरीज पहली बार हमारे यहा इलाज के लिये आया था /Below is given two patients progress reports, who are treated by our center and the patient came before 8 months for treatment purposes at our center. मरीज का इलाज १२० दिन तक करने के बाद उसका दुबारा एच०आई०वी सन्क्रमण का लेवल जान्चने के लिये परीक्षण कराया गया जिसकी रिपोर्ट नीचे दी गयी है / दोनो रिपोर्ट को देखिये और बीमारी मे आये हुये परिवर्तन को देखिये /After 120 days of Ayurveda Treatment, the same examination were done again and the progress can be seen in the report that parameters are touches normal level slowly and gradually. दूसरा केस एक महिला का है जिसको अपने पति से एच०आई०वी० का सन्क्रमण हो गया था / इस महिला का इलाज करने के पहले का जान रिप्र्ट नीचे दिया गया है /This is the second case of HIV infected patient who is female.The report is at the time of the start of AYURVEDA AND AYUSH treatment . See and observe below given report. इस महिला का आयुर्वेदिक और होम्योपैथिक और यूनानी के अलावा प्राक्रतिक और योग के साथ काम्बीनेशन / इन्टीग्रेटेद दवाओ और मैनेज्मेन्ट के द्वारा १२० दिनों तक किया गया / इसके बाद इसकई दुबारा जान्च करायी गयी /A combination / integrated Ayurveda and Ayush treatment and management were given to this lady patient for 120 days. दुबारा जान्च करने की रिपोर्ट आप सभी के सामने है /After a primery course of Ayurveda – Ayush treatment of 120 days the patient was suggsted to go for the screening of the same test which have been done earlier. दोनो रिपोर्त को देखिये और आयुर्वेद चिकित्सा पर भरोसा करिये कि किस तरह से ऐसी लाइलाज बीमारियो का इलाज सम्भव है /See and observe the both reports and see the changes towards the normal parameters. We have always conveys to the medical fraternity that Combination / Integrated system of medical sciences, whether they are called complementary or other as per their own public, the treatment of the dreaded diseases are possible by Ayurveda / Ayush bases on the findings of ETG AyurvedaScan system along with other allied examinations. A CASE OF ”MENTAL DISORDER’ ; EXAMINED BY E.T.G. AYURVEDASCAN TECHNIQUE ; SURPRISING ULTIMATE CONCLUSION ; एक मानसिक रोगी का परीक्षण ई०टी०जी० आयुर्वेदास्कैन द्वारा किया गया और ्बीमारी की जड़ का अन्तिम निष्कर्ष क्या निकला ? HEPEZ SIMPLEX is an incurable disease condition. But Ayurveda Ayush therapeis treatment and management cures the condition or relieves the entire problem with calm trends. In August 2016, 25 yrs old young boy came for the treatment of HERPEZ SIMPLEX, for which he was taking ALLOPATHIC treatment in Bihar, where he reside , for one and half year back , before coming to me . The treating Allopathic doctor told to patient that this is an INCURABLE disease and have no treatment. Patient depressed after the doctor reply. One of my patient gave him my address and he came to me for the treatment. As per our procedure of examination by ETG AyurvedaScan machine and other supplementary examinations we concluded the geneis of the physical problem.A short and very initial report is given below. Before coming here, we requested patient to have an laboratory examination of the complaints. He done it and brought the same with his visit. The above report shows the presence of HERPES SIMPLEX in patient body. The Urine examination report shows the presence of WBC and level of pH and specific gravity. ETG AyurvedaScan gives the details of the scanning at rest position. An integrated treatment course of AYURVEDIC and ALLOPATHIC and UNANI and HOMOEPATHIC remedies and AYURVEDA management of do and donts , was suggested to patient for 120 days. After 120 days treatment patient was advised to come again for review and change of remedies and do and donts and management in fresh ways. He was advised to bring the report of the same laboratory test, which was done earlier. On 02 May 2017 patient came for review, see and observe the above reports. You will find the changes in the reports with progress. His all complaints have gone and have no physical problem yet, except the report shows one is positive and one is negative comparatively earlier when both of them are positive. 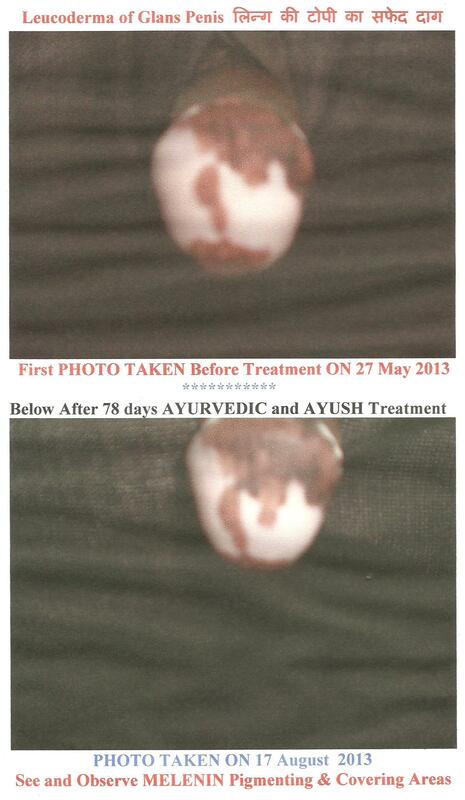 We have given him treatment with integrated approach successfully with the results.